I saw these over a year ago, and can't for the life of me remember where, but I took the idea and ran with it [but never with my scissors in my hand]. It's one of those projects you can slip in your purse and work on a few blooms here and there, doctor's office, car line, watching project runway....You know how I love portable projects. 1 Trace your circle on the backside of your fabric. This is your stitching line, so cut your circle slightly larger, 1/4'' or so. *Stitching hint: push your "needle down" button, so you can rotate your fabric frequently without it getting out of place. 2 Pull the layers apart and make a single slit on one side in the center, so it now looks like pac-man's mouth, long enough for you to turn the circle inside out. Push out edges with bone folder or tip of a pen lid. 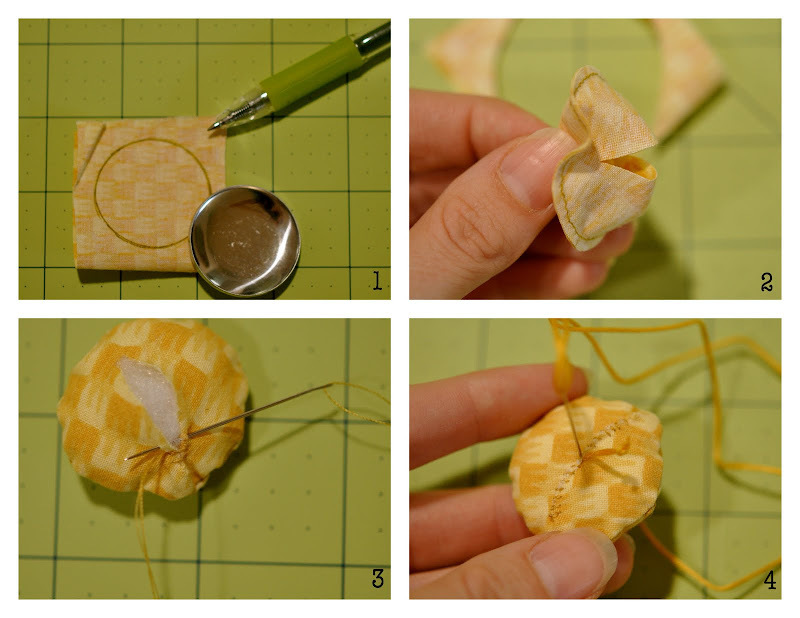 4 Make a knot in embroidery thread, and come up in the very center of your circle. Take your thread around to the back again, and come up in the center again, pulling to create your first indentation. 5 It's easiest to make the opposite indentation next, so you have a straight line across the circle. Leave as is or decorate center with seed beads or button. The bloom on the left was made with a 1 1/2'' diameter circle and the one on the right just 1'' diameter. As I was going through the kids' clothes earlier this week, I admitted [the first step, right?] my incessant need to have sweaters for them. SO many sweaters. I thought I'd spruce one up for little Clover with some Black-eyed Susans. I took the buttons off and switched them to the inside of the sweater and attached the Black-eyed Susans to the front so it can still be buttoned up. As long as you stitch the back slit up well, these are machine washable. On the Black-eyed Susan Blooms I just used a single strand of the embroidery thread for a more delicate petal delineation. 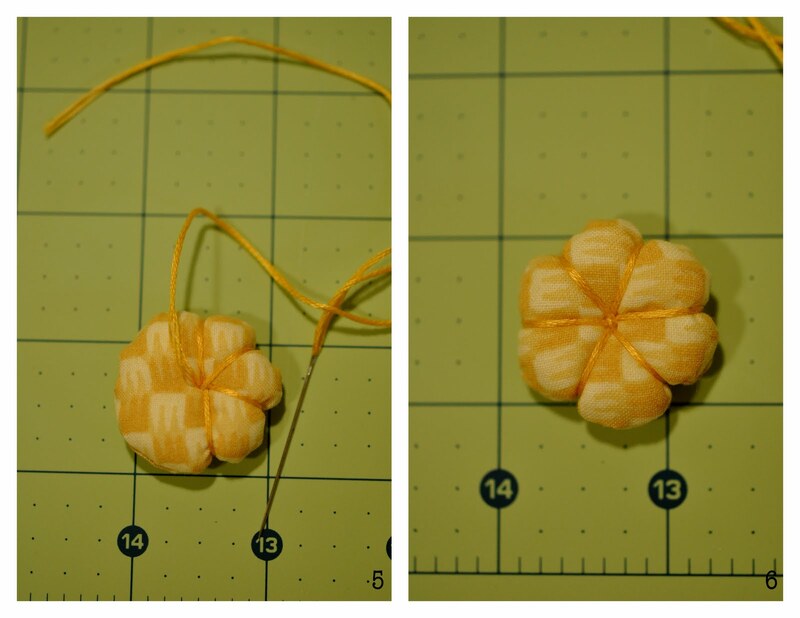 For Puffy Hair Blooms, just slip a bobby pin through the embroidery thread on the back. Go! and create a profusion of Puffy Blooms! You are a genius! These are so dang cute! Adore them! Thanks for sharing this piece of beauty!! How cute are these? Definitely a little something that I must try! Oh, very cute! I love it! Your projects are so stylish! Thank you for sharing your knowledge and gift. VERY cute-and quick and easy too-a great combination. I love these! Sew very kee-op-dah! Makes a dad proud! Clover looks ADORABLE! She looks like a jcrew model with her hands in her pocket! Wow! These are great!!! So much better than the lucite plastic flowers. I'm always looking for "portable" projects and these are perfect. Thanks for the wonderful tutorial. And black eyeds are my personal favorite, so I'll have to do those first for me! These are definitely cute as! Gonna give it a try as I need a portable project. I reckon they'd look great totally covering a cushion. You are so good Katie... you always get my creative juices flowing! Oh, those pictures of Clover are too cute! And the puffy blooms (and sweater)...also too cute! Oh Katy! I love it! super cute! I love Clover's sweater. I love that you did a whole roll of flowers. I would have just done the top button! Thanks, Katy! You're a wonder! TOTALLY making these, and I love the coral colored dress on your daughter, where did you get that pattern, or is it an original? Clover is killing me with her hands in her pocket. Too cute! Also her sweater is not helping! It sells out quickly, but keep your eye on it as she restocks every so often. these are VERY cute! love all the ways that you changed them up! I'm in love with these. thank you! Could you tell me how you get your daughters hair in those cute twists? How do they stay?? Part her hair, a row at a time. Take a small chunk of hair in the front, take another small chunk right behind it. Twist once or twice and add another chunk to one of your two strands. Continue adding chunks of hair to your two strands as far back as you want. Weave the bobby pin up and down a bit through the end of the twist before pushing in all the way, toward the front of the twist. Can you tell me how to make the vines/stems leading up to the flowers in the first photo. I recently had my favorite sweater get slightly eaten by the washer or something and there are little holes all over it from tears and that would be the perfect way to cover the holes up. Thanks so much for keeping me motivated!